One of the eight specific wine regions in the Austrian state or generic wine-growing region Lower Austria, It is from the Danube flowed through, on the northern banks of which many of the most terraced Vineyards are lying. The partly very steep vineyards are among the steepest vineyards Austria. The narrow valley along the Danube is only 33 km long and the winegrowing area 15 km long. The gateway to the west makes that Benedictine Monastery Melk (since 1089), in the east it is through the over 1,000-year-old city Krems limited. In the 5th century lived at Favianis (Mautern) the monk Severinus (410-482) in the middle of vineyards, which proves a viticulture. The English king Richard the Lionheart (1157-1199) was on his return journey from the Third Crusade near Wien captured and on the castle Dürnstein recorded. King Henry II (973-1024) gave 1002 the small settlement Liupna, today's Loiben, the monastery Tegernsee. The Viennese mayor Karl Lueger (1844-1910) served around the turn of the century at a ball of Emperor Franz-Joseph I (1830-1916) a Loibner wine, which with the words: "I did not think that in my countries like that good wine " commented. Then Lueger proposed the name "Loibner Kaiserwein". The Benedictine monastery Melk owned vineyards not only in the Wachau, but also in the communities Gumpoldskirchen, Pfaffstätten and to bathe, In Rohrendorf near Krems is still a vineyard of about 100 hectares in the possession of the monastery; which was donated in 1113 by Leuthold von Kuenring. By wine from the Stiftskeller in the year of the second Turkish siege of Wien 1883 a fire was extinguished, which had already captured the church tower and threatened the bells. In 1703, 24,000 buckets of wine were stored in the cellars, which was about 1.3 million liters! Finally, with the revenue from the Zehentwein In the 18th century the conversion of the Melk Abbey to today's Baroque-style building took place. Climate changes and strict levies led to the decline of wine culture. It was not until the mid-19th century that top-quality wines were produced by the introduction of new varieties such as Veltliner and Riesling. The terrain is usually shallow with high and therefore heat-storing mineral content. The soils are composed mainly of loess, sand and trenches. In some terraced vineyards the humus layer is not more than 50 centimeters, underneath is the bare granite. The Atlantic-Pannonian mixed climate is characterized by the moisturizing Danube, which has a heat-boosting effect through reflection. An important factor for the special climate is the big positive temperature difference between day and night. 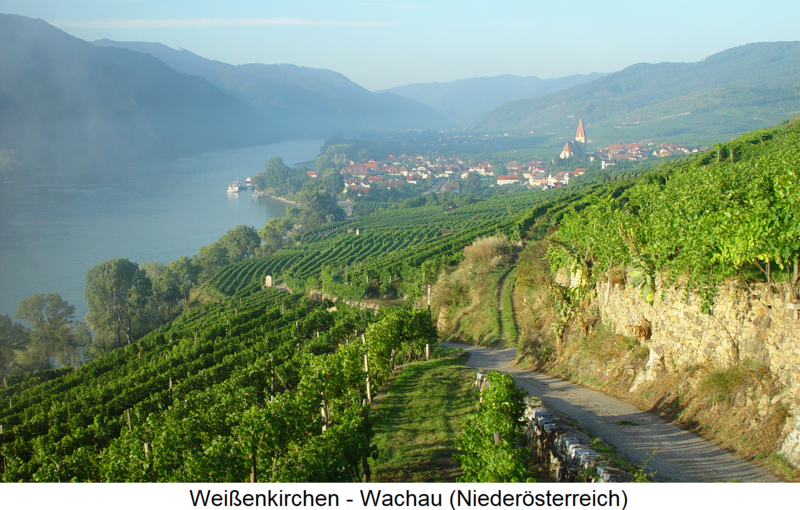 The Wachau was in the category "cultural landscape" in 2000 by UNESCO for World Heritage appointed. 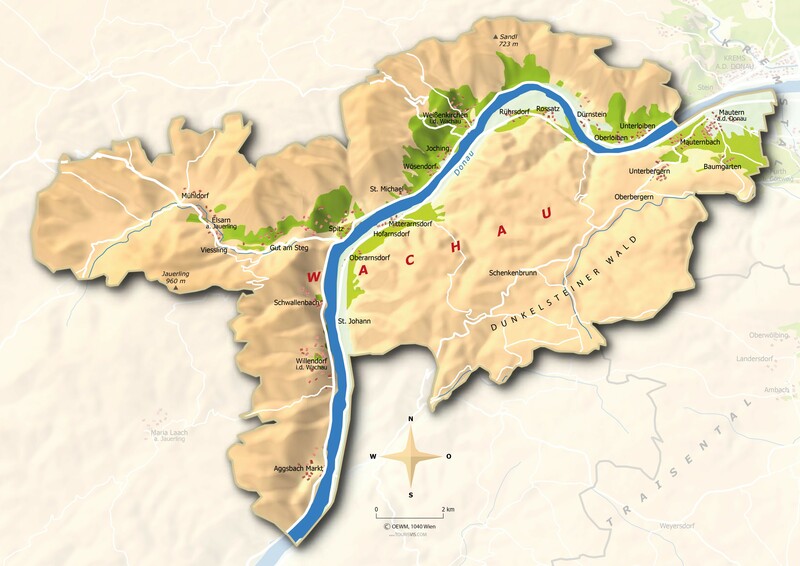 The Wachau winegrowing communities extend mainly on the left and a few also on the right of the Danube. These are on the left bank with their vineyards (layers) Dürnstein (with municipalities forest huts, Rothenhof) with flea ax, women's wine gardens, Himmelsstiege. hollerin. Kaiserberg. stone's throw. Kellerberg. Pfaffenberg and bulk; Dürnstein-Loiben (Oberloiben, Unterloiben) with Kreutles. Loibenberg, Mill point, bulk and Steinertal; Pointed (Good on the jetty, Schwallenbach, Vießling) with Auleithen (Urriede the grape variety Neuburger ) Axpoint. Tausendeimerberg. Honivogl. Singerriedel and Steinborz; Weissenkirchen (Joching, St. Michael, Wösendorf) with Achleiten, Buschenberg, Women's Gardens, Manufacturing, Hochrain, Kirchweg, Klaus. Ritzling and Steinriegl. The communities on the right bank are Rossatz-Arnsdorf with Frauenweingärten, Holzapfelfeld, Im Mugler, Kirnberg, Kreuzberg, Poigen, Steiger u. Zanzl; as well as Mautern with Point, robbers, Silberbichl, Süßenberg u. Wine Mountains. In 2015, the vineyards covered a total of 1,345 hectares of vineyards. Compared to 2009 with 1,350 hectares there was no change. The proportion of red wines is 8.7% and the proportion of white wines is 91.3%. The dominant white grape varieties Grüner Veltliner and Riesling together occupy three quarters of the total area. The DAC system is finished in the drawer, so to speak, and will be launched in 2019 - description follows. Well-known producers are Alzinger. Bäuerl Wolfgang. Break Richard. Dinstlgut. Domain Wachau. Donabaum In the Spitz. Donabaum Sighardt. Eder Andreas. Christian. Fisherman Josef. Gallhofer. Gritsch Josef. Gritsch Mauritiushof. Gritsch novel. Hick Maria & Manfred. Hirtzberger Franz. Högl Josef. Höllmüller. Wooden apple Karl. Hutter Fritz. Jamek Josef. Kartäuserhof. Knoll Emmerich. Lagler Karl. Machherndl. Muthenthal Martin. Nikolaihof. Pichler Franz Xaver. Pichler-Krutzler. Pichler Rudi. Prague. Rixinger. Enamel Johann. Schmidl Theresa. Schneeweisschen. Snow White Anton. Black Johann. Sigl Heinz. Tegernseerhof. Urbanushof Paul Stierschneider. Veyder-Malberg, Under the brand name Vinea Wachau Nobilis Districtus Typical quality wines are produced according to strict quality criteria. This page was last modified at 9 February 2019 at 14:56.